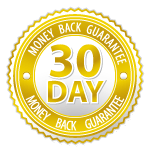 We offer a no hassle “30 Day Money Back Guarantee”. If within 30 days from date of purchase you are not satisfied with the product, you may return it for a full refund. Note: Please contact us by phone, email or contact form for assistance with proper adjustment or installation. NO OTHER WARRANTY EXPRESSED OR IMPLIED WILL BE HONORED. INSTALL THIS PRODUCT AT YOUR OWN RISK.